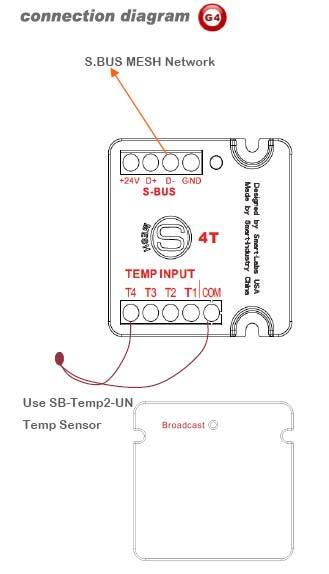 A state of Art Mini Sized Temperature Measuring Module that accept 4 Addressable Inputs. This Innovative Design allow easy mounting any where within the Body of any third Party Equipment, or inside any Wall Back box conveniently. 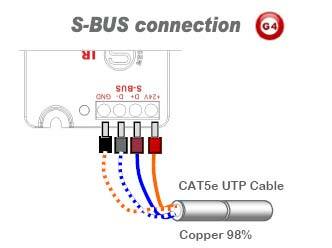 The 4-T Works with SB-Temp2-UN Temp Sensors and accept wide Temperature ranges from –Ve 50 to +ve 150 Degrees Celsius. This Device Is Perfect for use with Under floor Heating, Pool temperature, wine Cellar Temperature, Sauna, Jacuzzi and Many More. **Added function: Bigger screw terminals, Broadcast button, and mini USB firmware upgrade port. Under floor Heating, Pool temperature, wine Cellar Temperature, Sauna, Jacuzzi, Air Ducts and Many More.